There comes a time on almost every extended trip when one finally loses the desire – hopefully temporarily – to get back in the ring. You have been under the cosh a little too long and things that you once thrilled to now have a grey and grimy lustre to them. So it was for us arriving in Varanasi. The overnight train journey had been pleasant enough. The auto-rickshaw ride to the hotel had passed without a haggle. Our room was fine. All in all not a bad first hour. It was that afternoon, strolling along the stone-stepped ghats that line the sacred River Ganges that we first noticed a subtle shift. It all looked very dirty. To be fair we had known in advance that this, one of India’s holiest cities, was a congested and polluted place. But where normally we would have skipped and dodged around the rubbish, copious piles of excrement, broken paving and open drains and other obstacles too numerous to mention, now it was a chore. And a hot and joyless chore at that. Add in the constant demands on our attention, the genuine and the not, that normally we fielded with friendly banter and it was hardly surprising responses were shortening or not coming at all. I do not like to feel like this. It is not my natural state and it hangs heavy on me. I retreat into myself and find I am in a harder less extrovert frame of being. I recognise that it is not where I want to be but once a certain tipping point is reached the slide down becomes inexorable and can be rapid. Once down in this hole – largely of my own making – I experience a claustrophobic sense of wanting to get away from everything and everybody. Rather like Greta Garbo ‘I just want to be alone’. And on this occasion both Grace and I were perfectly – or imperfectly depending on your perspective – in (or out) of tune and in the same space. Part of my downward spiral had been exacerbated by lack of food. Where normally we prepare for journeys with military precision we had been lax the day before and I had not eaten a decent breakfast: in fact not much of a breakfast at all. My systems began to see-saw rapidly and normal service went haywire (good friends will know this of old and can always be counted on to ‘Get David fed’ properly and on time). We talked and discussed the plain and simple fact that after over 3-months we were suffering from a severe surfeit of all things India. We were also a little disappointed as a recent American acquaintance we had planned to meet here had gone home at short notice due to severe illness. Catherine has run a charity in Varanasi for over 8-years and we had lined it all up so that we could help her for a week or more. 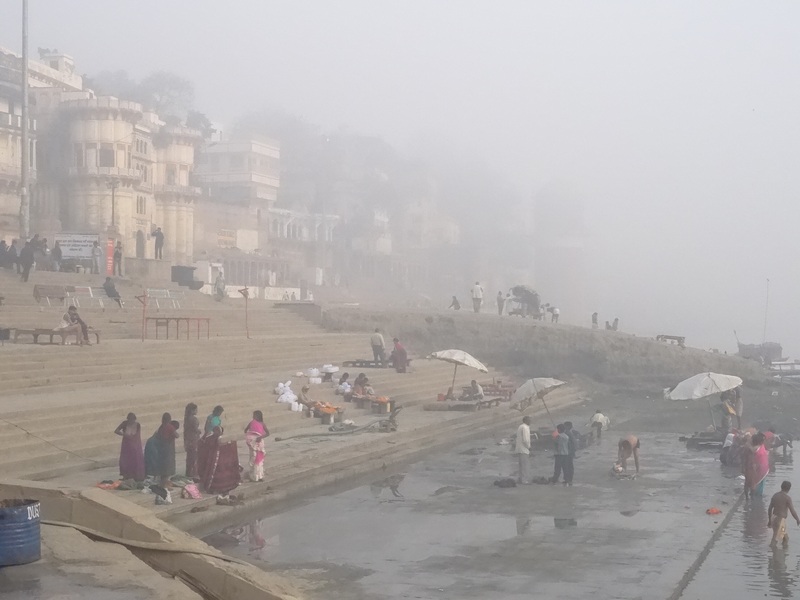 We walked along the ghats ignoring every call that came our way and wondered what course of action we needed to take to preserve our sanity and were batting ideas back and forth when a cheery English voice interrupted our conversation. It was Mathew, who we had spent over 5-weeks with at Anandwan, fresh from Nepal and on his way to Mumbai and a flight back to Blighty. It was such a gloriously unexpected pleasure to be with someone we knew and in a very short space of time we could feel a more positive feeling begin to establish itself. In the process of catching up we discovered that in 2- days time there was another silent retreat starting at Sarnath a mere 16-kms from where we stood. One of the teachers would be Zohar who, with her partner Nathan, had led the Anandwan silent and work retreats. My initial reaction was a knee-jerk ‘Not on your Nelly!’ But as we discussed our options afresh in the light of this news it began to make perfect sense. We were tired and a bit jaded and still had just over 4-weeks to go in India. Then we would travel on. A rest up now in the tailor-made environment of a retreat setting would be just the recharge we needed to get ourselves travel fit again. It would give us time to look at what we had done so far, what we wanted to achieve next and also give us the time and space to further our meditation practice. The Dharma path had unfolded before us at a very timely moment. Walking back along the river later that night we passed one of the burning ghats. There were five funeral pyres in full flame sending sparks and human souls skyward. Human entrails tumbled out of one fire whilst in another an arm was raised as though waving goodbye. There was a popping sound in the midst of a vortex of flames. Just another day in the life of Varanasi. This entry was posted in India, travel and tagged change, cremation, east meets west, India, Meditation, travel, Varanasi by Ashby's World. Bookmark the permalink.